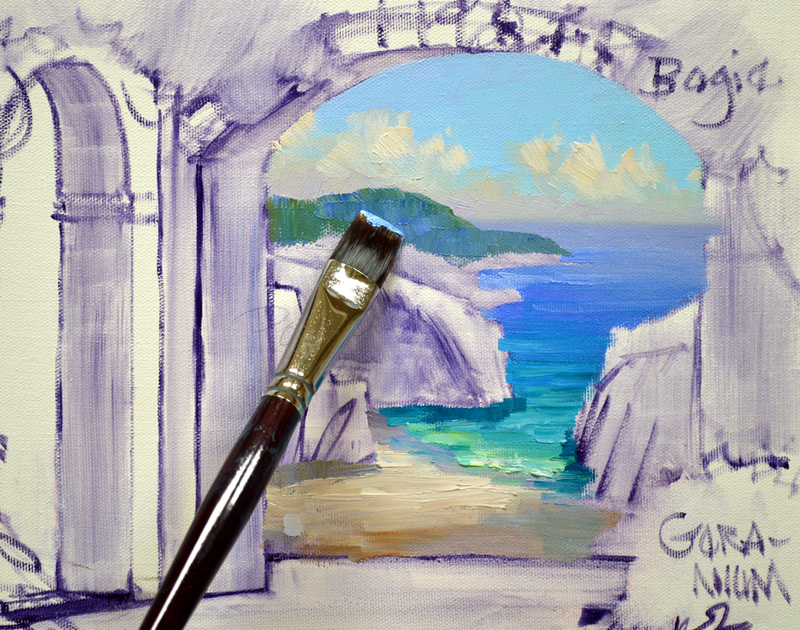 Now…..let’s get to painting. We’ll start with the sky. Since it is the source of light it influences the rest of the piece. Soft fluffy clouds in the summer sky are warmed by the sun. “Painting Forward” I begin working on the water. 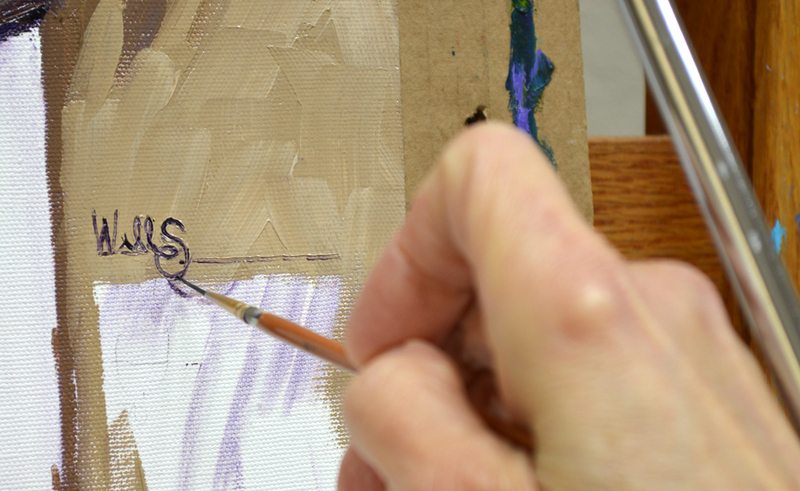 One rule that helps to give the appearance of depth in a painting is: Soft Edges go Back, Sharp Edges come Forward. When the distant edge of the ocean is first pulled over the sky the line is hard or sharp. You can enlarge the picture to see this better, just CLICK on the image. To soften the line I make a series of ZigZags along the length of the horizon with a clean brush. With a larger Bright brush that is also clean I pull over the ZigZags. 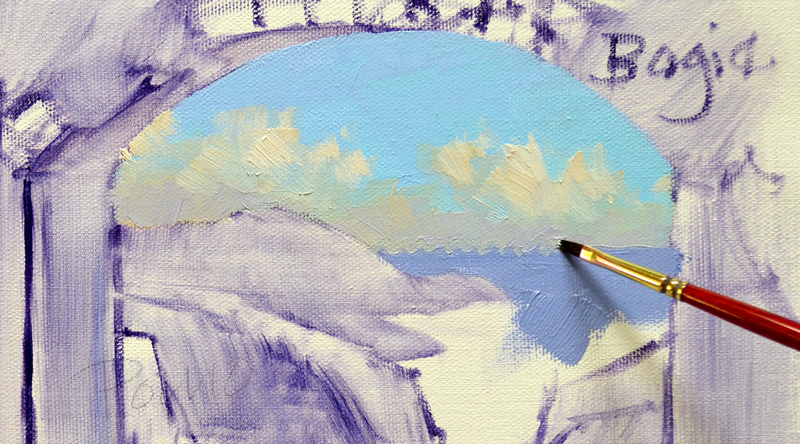 The larger brush smooths the sky and water colors together, softening the Horizon Line. Painting the water the colors are made brighter and more intense as we come closer to the secluded beach. This is another rule the makes paintings look more realistic: Muted Colors Recede, Intense Colors Jump Forward. The shallow water is greener because the sunlight streaming through the blue water illuminates the creamy, soft yellowish sand. Blue + Yellow makes Green. The next rule that comes into play is: Cool Colors go Back, Warm Colors come Forward. 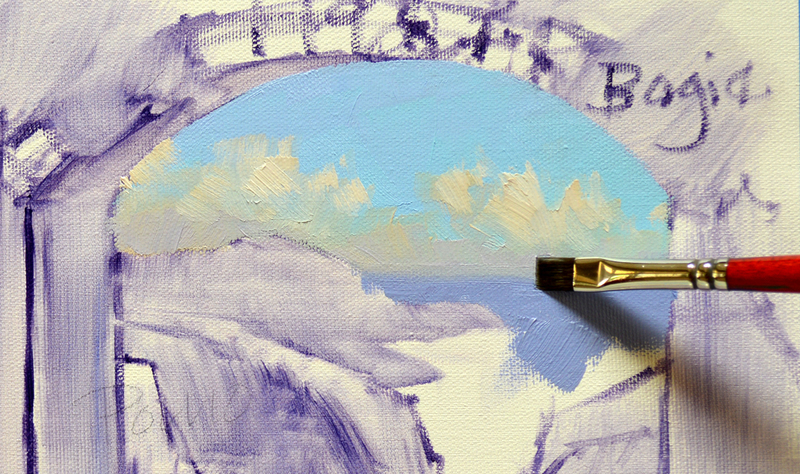 I start with the bluffs farthest away, making them cooler or bluer. The closest bluffs are painted with warmer colors. Can you see how they come in front of the cooler cliffs in the background? It’s fun adding the highlights where the sun strikes the distinctive rocks. I had originally planned to have a palm in the lower left corner of the arch. Like the tree was partway down the hill and you could just see the top of it peeking up over the edge of the terrace. 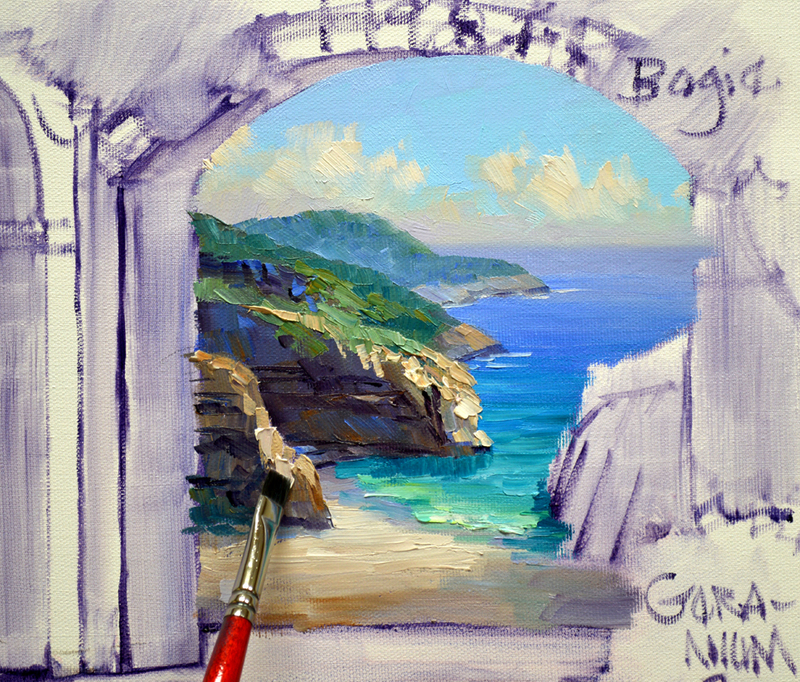 It was in my sketch but I’ve decided not to put it in because it would cover too much of the rocks and beach below. 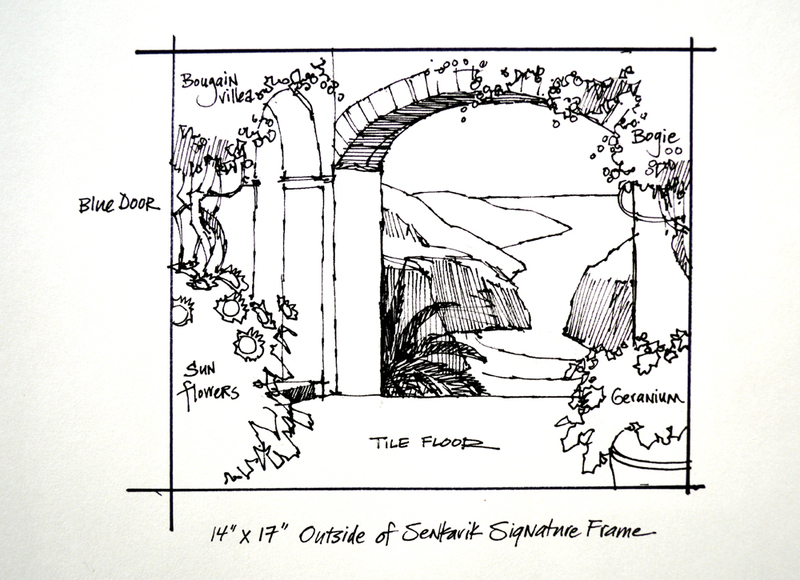 Instead I’ll add a couple of pots of Petunias at the base of the arch by the door. 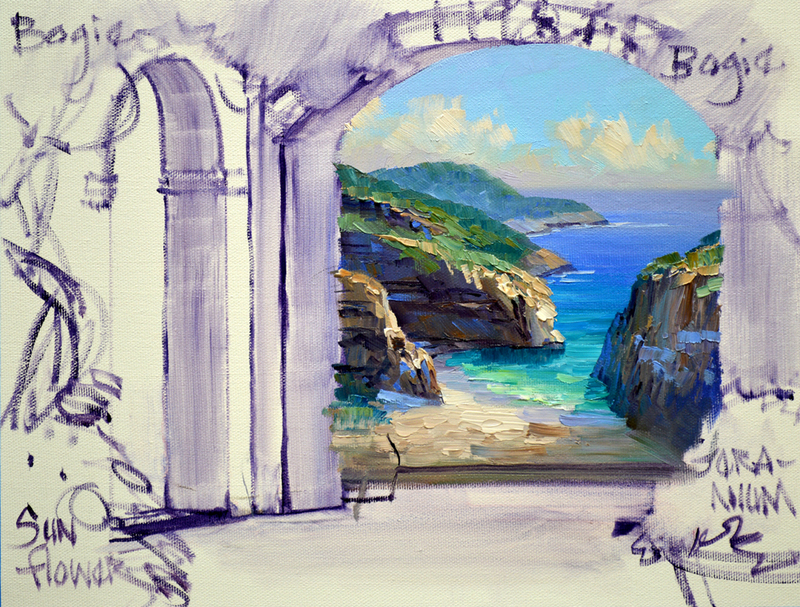 I think the painting is so cool at this stage with the background complete and the foreground still sketched in. Tomorrow construction begins on the building, bring your work gloves. We’ll also be laying tile! See ya……..
Before we get started today I want to share Jack’s latest article with you. Just CLICK HERE to read Keep Your Blinkers On. 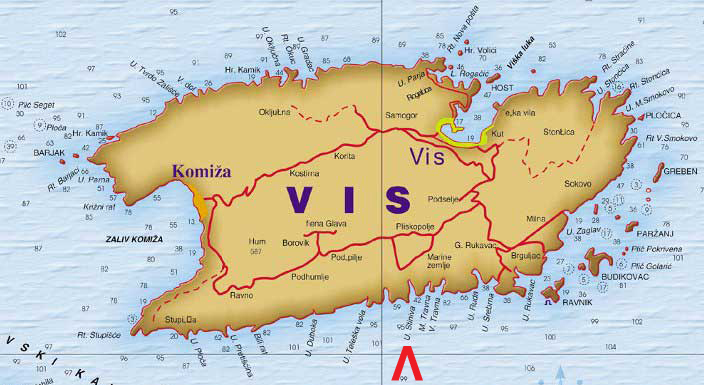 Today we’re going to Vis, a small Croatian Island in the Adriatic Sea. This is a Christmas gift for the son of a long time collector. Erik loves the ocean and this beautiful island. We’ve traveled in this area so this collaboration brings back warm memories for Jack and me. I’ve selected Stiniva Beach on the southern side of the island as my background. The red arrow highlights the location on the map. You can click on the image to enlarge the picture. 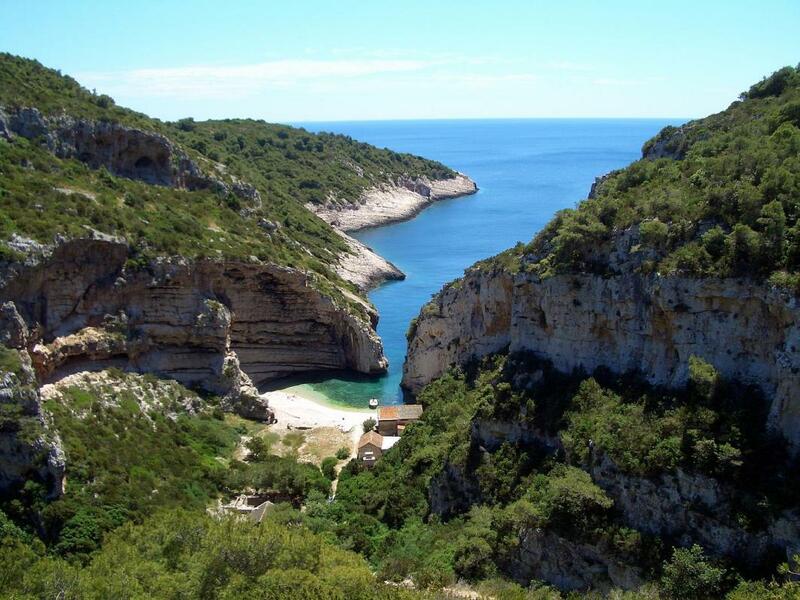 Here’s a picture of Stiniva Beach. Isn’t it pretty? Terry and I decided it would be fun to be standing on the terrace of a villa looking out at the distinctive bluffs and crystal clear water below. I’ve done a sketch to solidify our ideas. 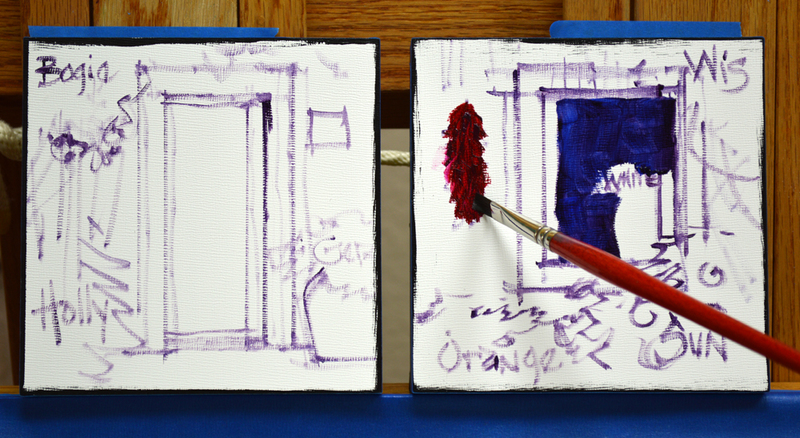 Starting on the canvas I sketch my plan with a thin oil wash made of MUD (Ultramarine Blue + Alizarin Crimson) + Liquin. We’re all ready to begin painting. Hope you’ll come back tomorrow and watch. If you would like to receive an email every time I publish a new post please feel free to subscribe to my blog. CLICK THIS LINK and scroll to the upper right side of the page. You will see a heading EMAIL SUBSCRIPTIONS. Just enter your email address and click the button “Sign me up!” It’s easy. And if you enjoy my blog please CLICK the FaceBook LIKE Button. As we say in Texas, “Much Obliged! Let’s go to Tuscany. 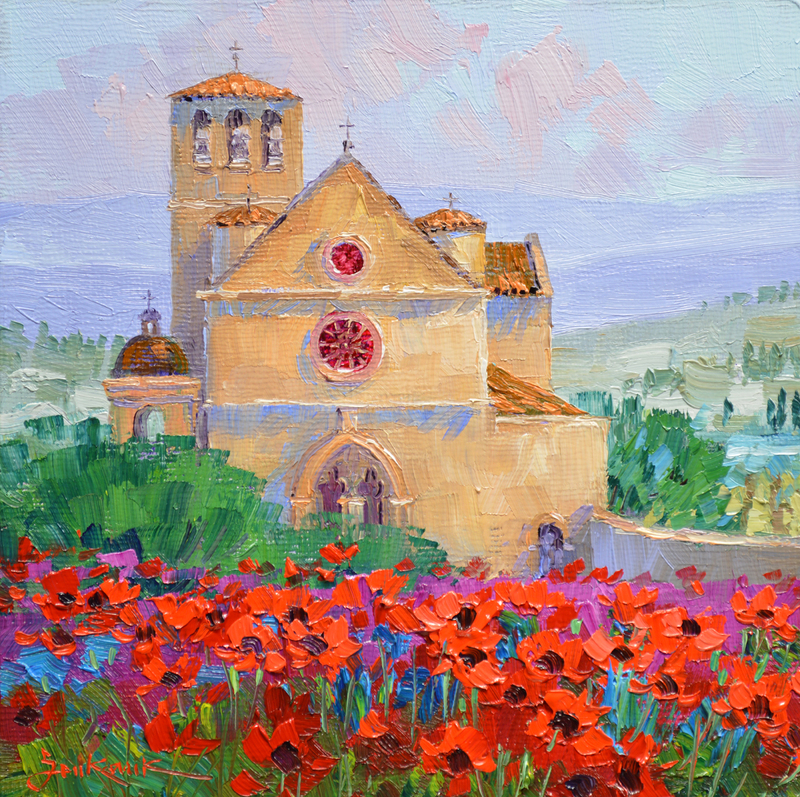 Assisi, Italy is featured on my eBay auctions this week. 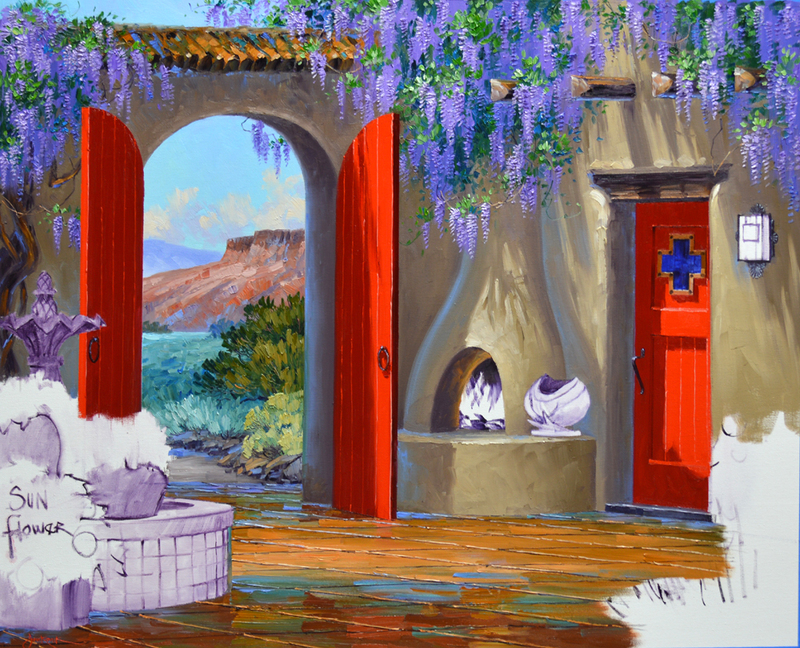 The picturesque village is the birthplace of St. Francis, the patron saint of animals. 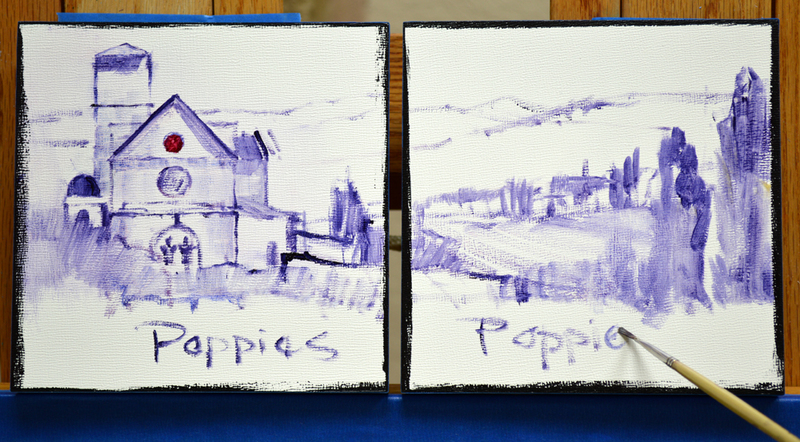 My initial plan is drawn up, working as if the two pieces are one canvas. The early morning sky, filled with clouds tinted pink by the rising sun, is painted first. Then I work forward through the hills. The most distant ones are made cooler, or bluer, so they recede. OPPPSSS!!!!! I got so involved in painting I forgot to take a progress picture. Each hill is made increasingly warmer following the simple rule: Warm Colors come Forward, Cool Colors go Back. This gives depth to the piece. The perspective of the rows in the vineyard also helps to give the appearance of distance. 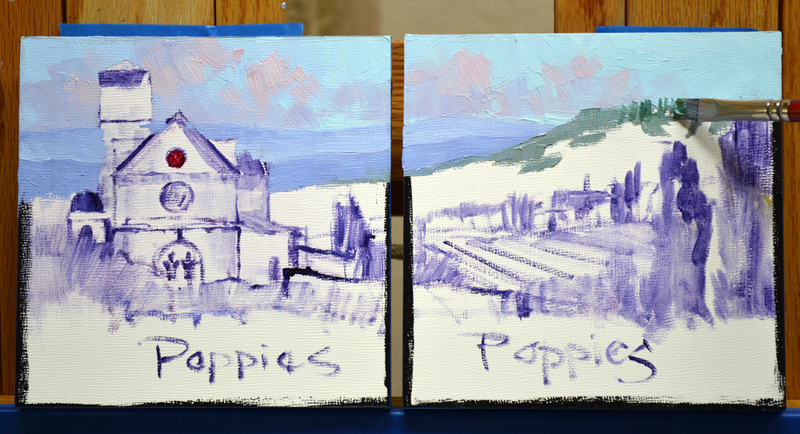 I begin blocking in the foreground Poppies with mixes of Magenta + White and Cadmium Red Deep. 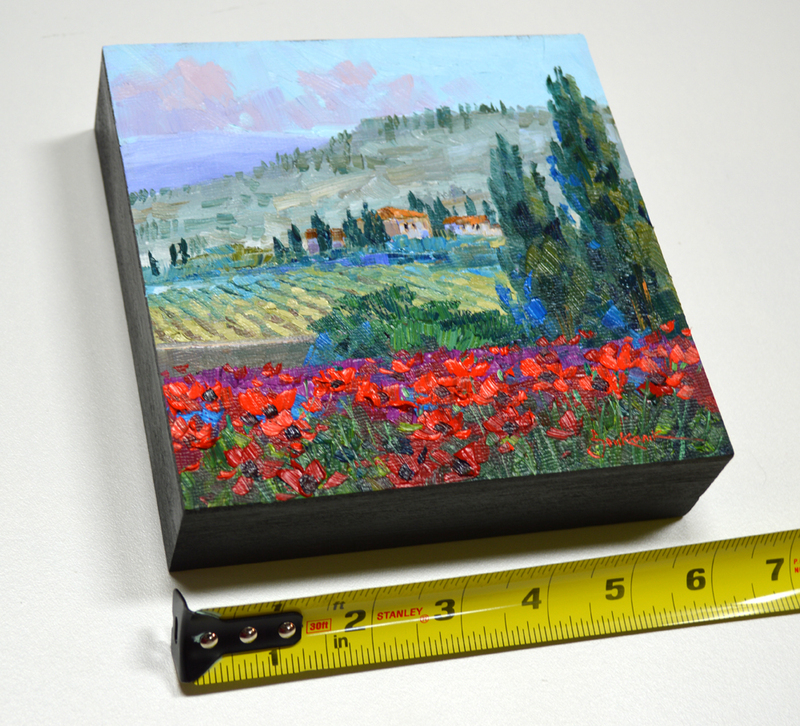 The warmth of Cadmium Red Light Poppies in the foreground makes the little villa and hills in the distance fall back even more. 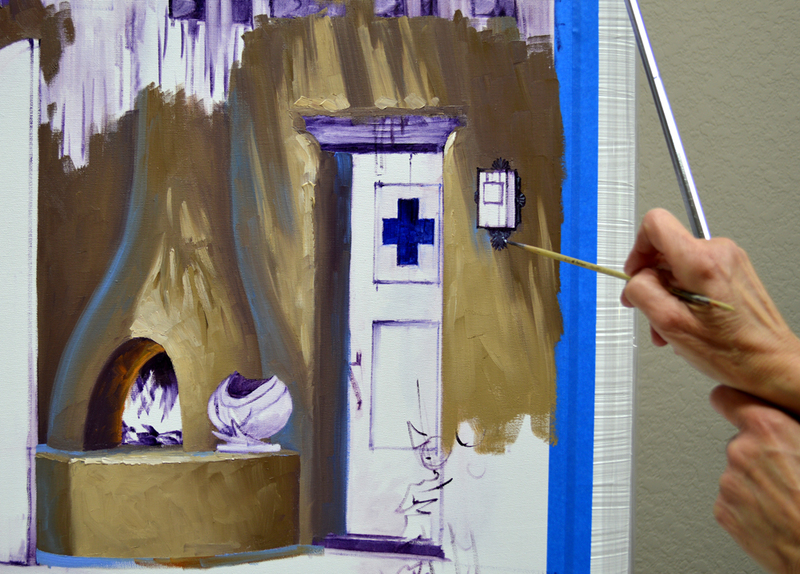 I so enjoy painting architecture, it’s fun to delineate the bells in the tower. Can’t you just hear them ringing out across the rolling hills? Oh,,,,don’t forget. You can enlarge any of the pictures by clicking on the image. CHRISTMAS is right around the corner. 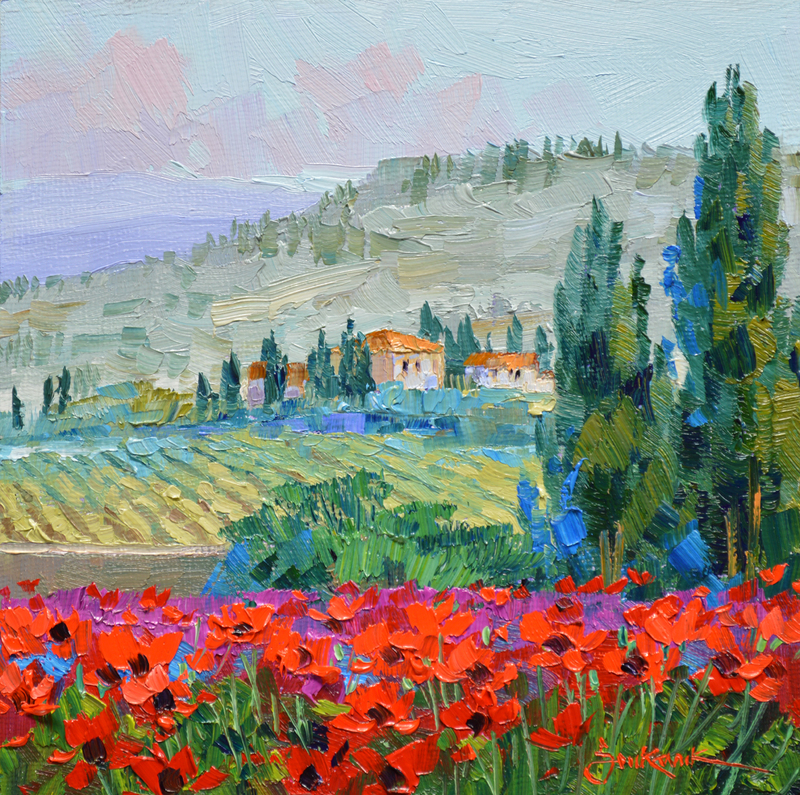 Give Tuscany to that special someone in your life, maybe even you! Senkarik Original EMBRYOS make unique gifts that bring smiles for years to come. The basilica of Saint Francis is a stately landmark, welcoming all who visit this quaint village. As the first rays of sun slip across the rolling hills of Tuscany they warm the ancient stone walls of this Jewel of Assisi. Love Spring??? Tired of winter already??? Enjoy the warmth and beauty of spring in Tuscany. 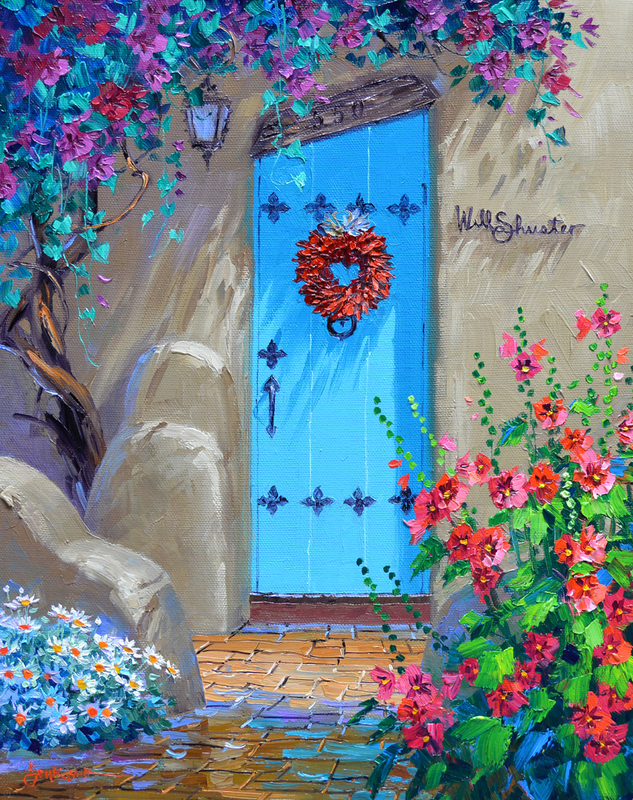 Take a magical trip to this enchanting land every time you look at Brilliance of Spring on your wall. The EMBRYOS can be displayed together or individually. These original oil paintings retail in our galleries for $390 each but to make it more fun we’ve started the bidding on both auctions at 1 cent. That’s right, ONLY A PENNY! 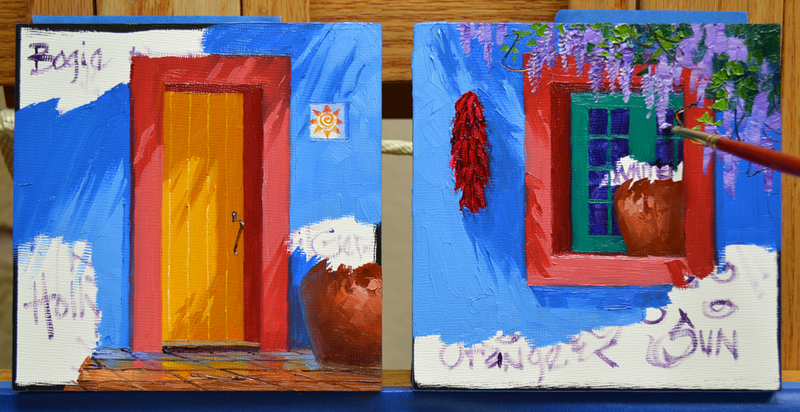 The auctions are staggered 7 minutes apart so you can win one or both Original Oil Paintings for your home or office. AND…..If you win the TWO EMBRYOS we will give you FREE SHIPPING! Don’t linger, the first auction ends Sunday, December 1 at 8 PM Texas (Central) Time. The surface of the walkway is covered with light and dark mixes of MUD (Ultramarine Blue + Alizarin Crimson) + Cadmium Orange + White. If you would like to learn more about our Double Primary Color Mixing System CLICK HERE. A few strokes of the door color are brought down into the shadow to give the feeling of reflections. I want the pavers to appear wet. 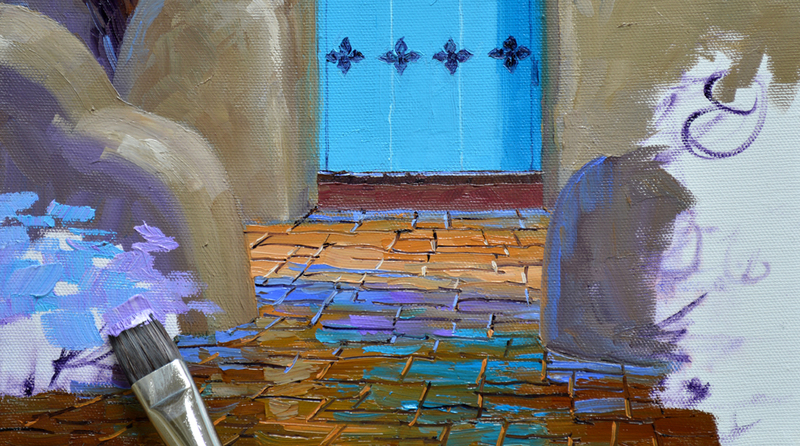 Then I begin drawing the perspective lines of the irregular tiles into the wet paint of the floor. Horizontal lines separating the individual tiles complete the floor. Then the mass of White Daisies is blocked in with several shades of blue and purple. This will be the shadow color of the White flowers. 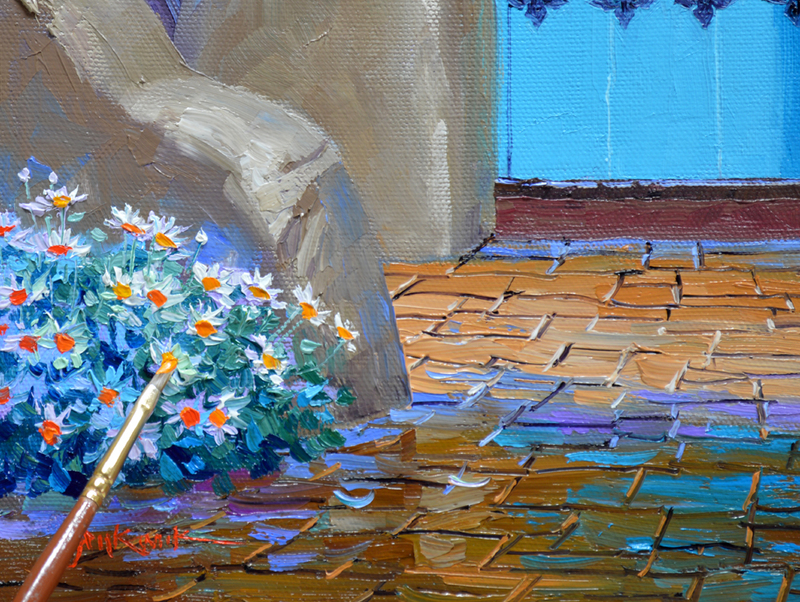 Gray Greens mixed of Pthalo Blue + Cadmium Orange + White are used for the leaves of the Daisies. Pure White is used to highlight the petals accented by the sunlight. 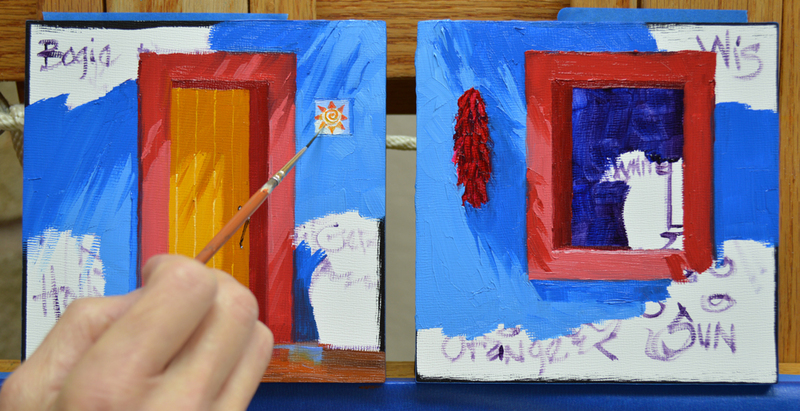 Then rich centers of Cadmium Orange and Cadmium Yellow Medium are added. The Hollyhocks are painted in the same sequence: Flowers First, Leaves Last. By working in this order the color of the blossoms remains crisp and clean. 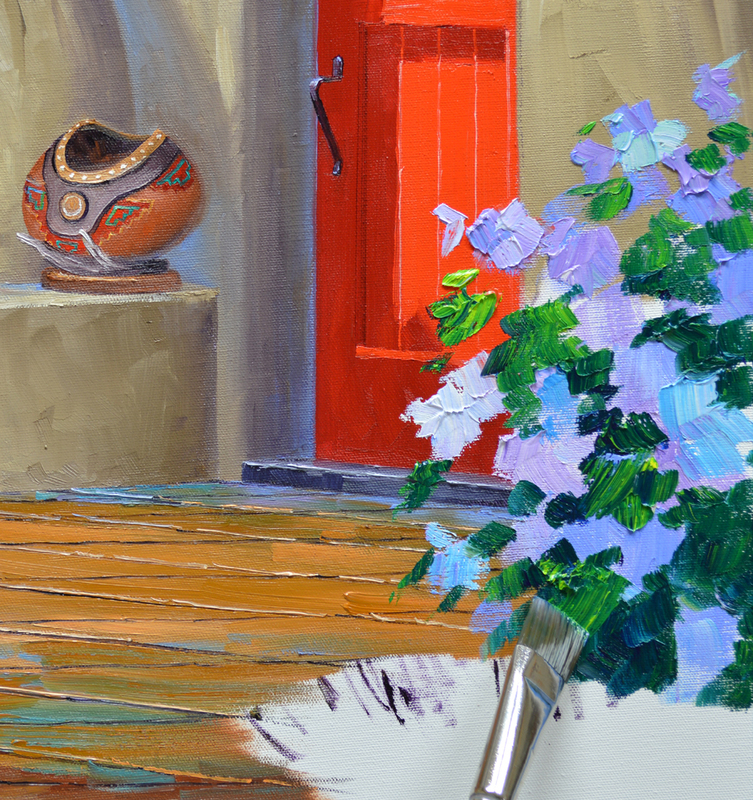 If the foliage was blocked in to begin with, my brush would pick up some of the green when painting the flowers, muddying their color. Is that Door Crooked or What????? 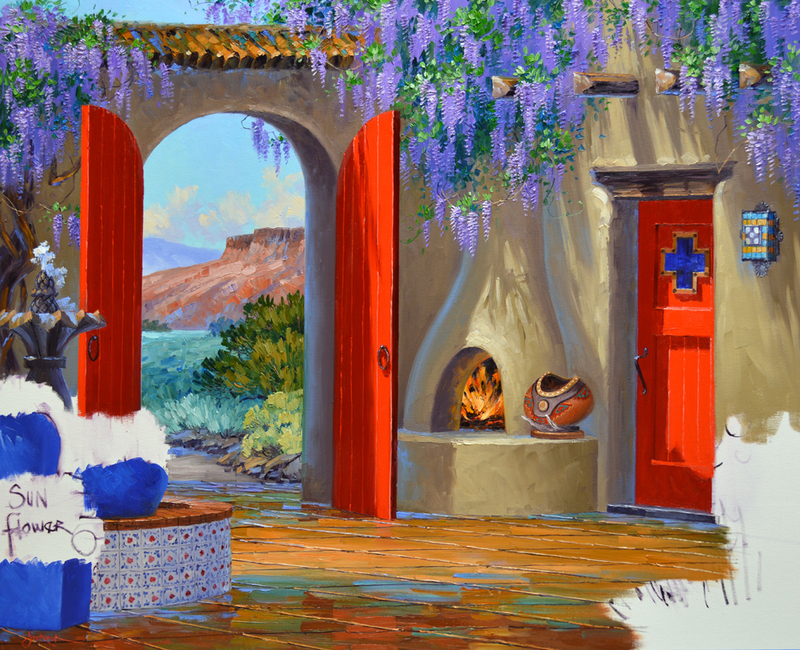 This is a fun piece, a surprise for one of our collectors who loves Santa Fe and collects art by many of the old Taos artists. 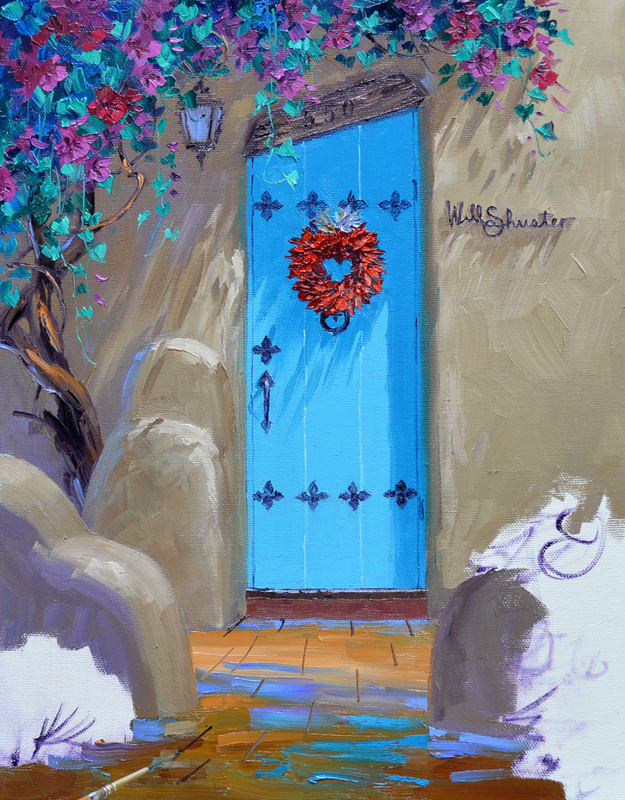 He especially likes the unusual door of the Will Shuster house on Camino del Monte Sol. 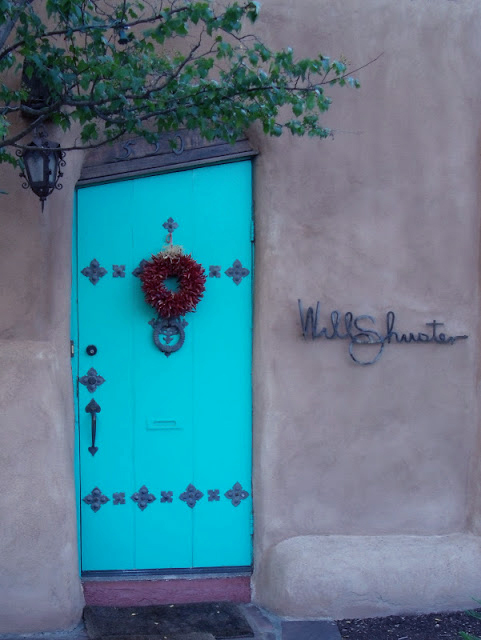 In 1921 William Shuster formed the original Santa Fe art colony along with Willard Nash, W.E. Mruk, Josef Bakos and Fremont Ellis. The group came to represent some of the best in Northern New Mexican primitive art. 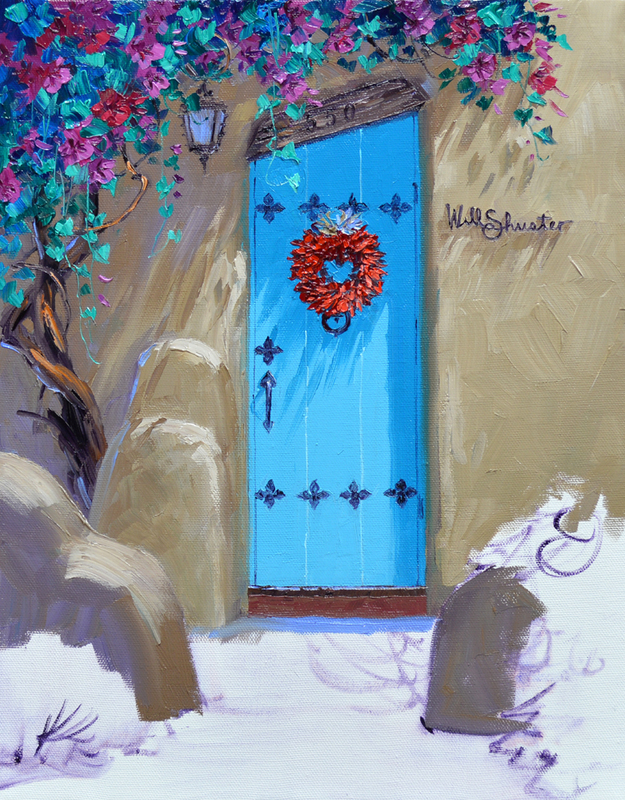 Shuster is considered a quintessential Santa Fe artist. But probably above all Will is most widely known for his creation of Old Man Gloom, Zozobra, at the annual Santa Fe Fiesta. 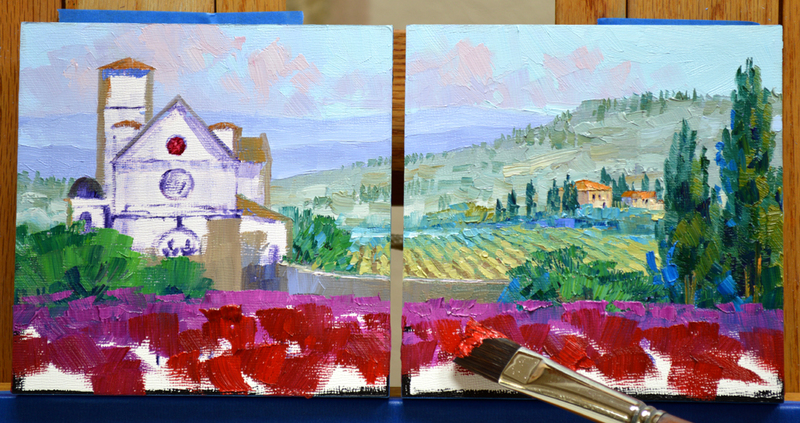 My first step is to draw up the initial plan on the canvas in a thin oil wash made of MUD (Ultramarine Blue + Alizarin Crimson) + Liquin. 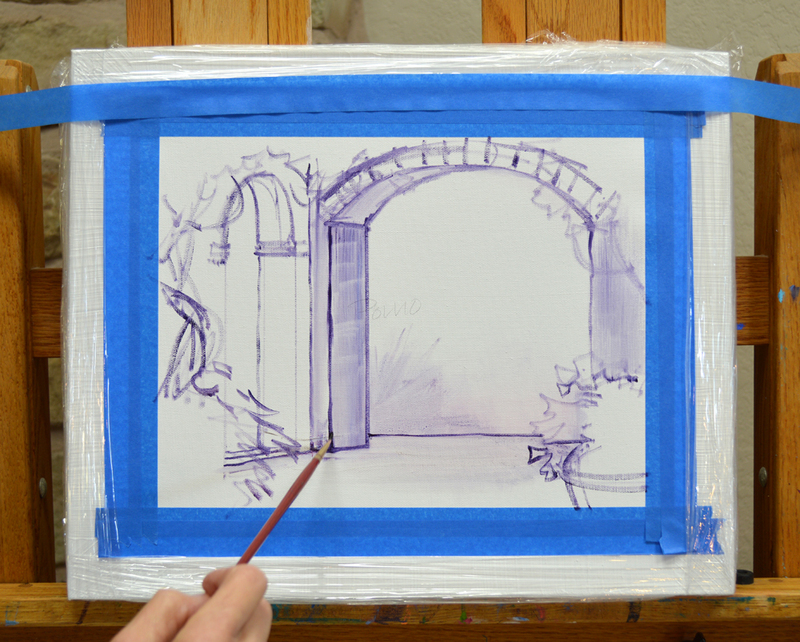 The canvas is mounted to cardboard which makes it easier to handle while the paint is wet. If you would like to see this or any of the other pictures larger just click on the image. 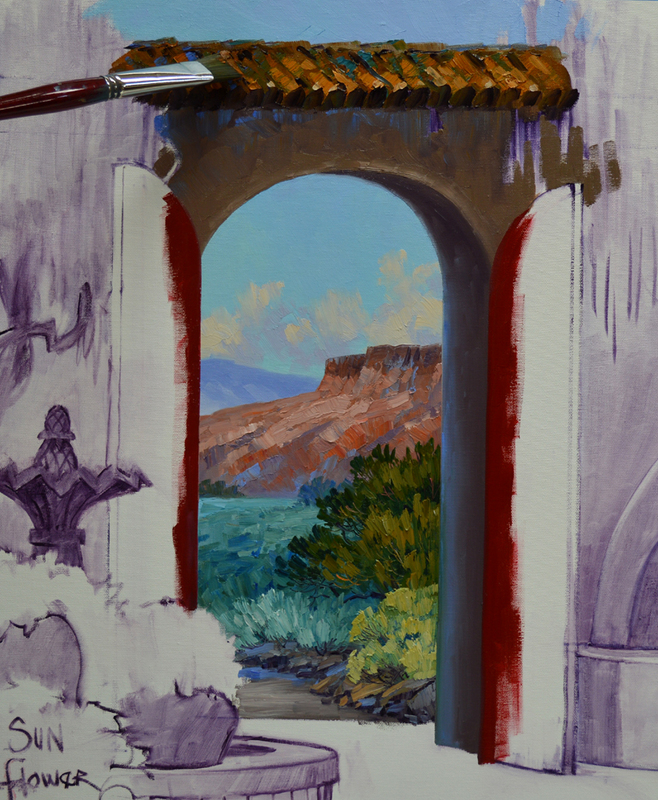 I begin blocking in the light and shadow pattern on the adobe walls. 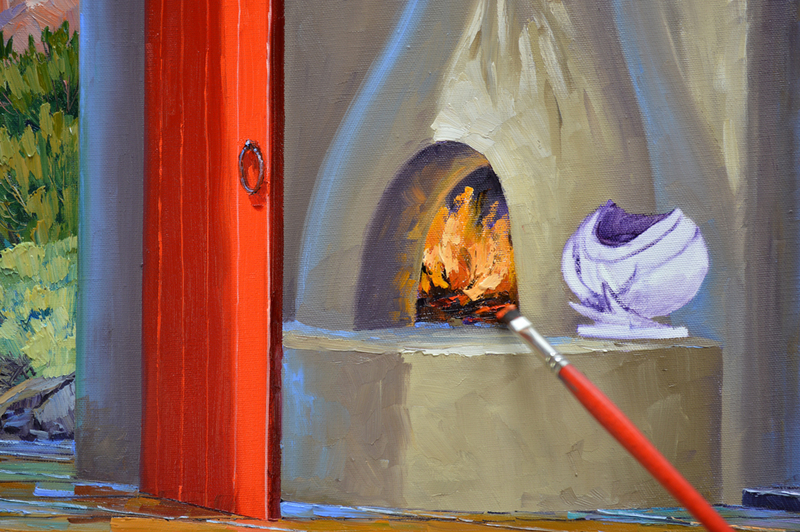 The lantern by the door is drawn into the wet paint. My wrist is braced on my mahl stick to steady my hand. To find out more about our mahl stick CLICK HERE. The wrought iron signature of Will Shuster is so cool. It’s a challenge to paint though! You can see the horizontal quidelines I drew on the wall. I’ll come back when I’m finished and paint them out. As in the previous step I’m braced against the mahl stick. This really helps to take the strain off your shoulder while painting fine details. The rough adobe wall and trunk of the vine are finished so I turn my attention to the unique doorway. Jack thinks the carpenter who built this door frame may have imbibed just a bit too much! 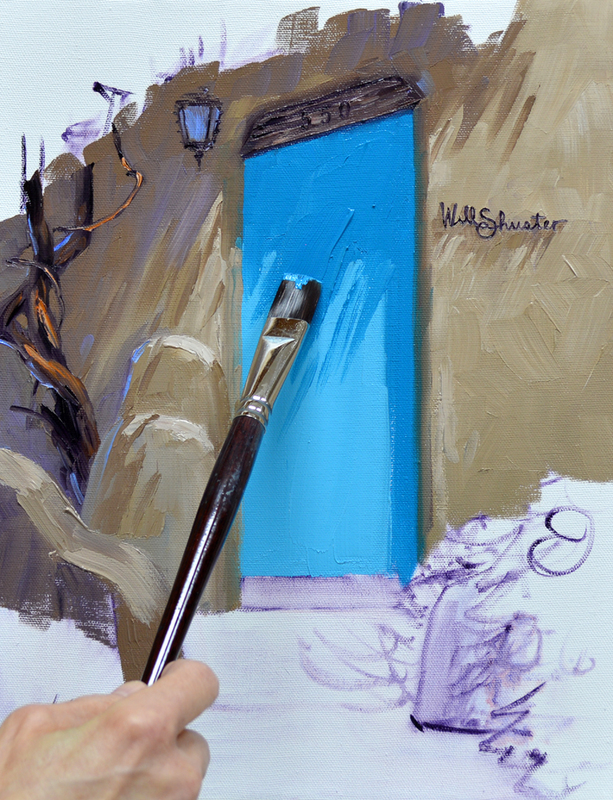 Light and dark shades of Pthalo Blue + a touch of Lemon Yellow + White are used for the door color. Wrought iron details and a chili pepper wreath finish out the unique door. 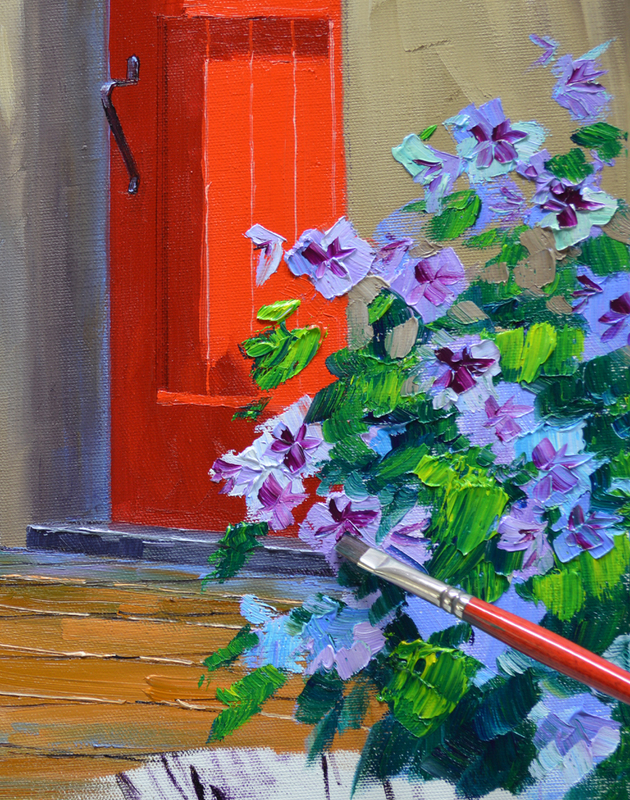 The Magenta blossoms of the Morning Glory Vine are blocked in first. Them the cool green foliage is painted around the flowers, helping to shape them. 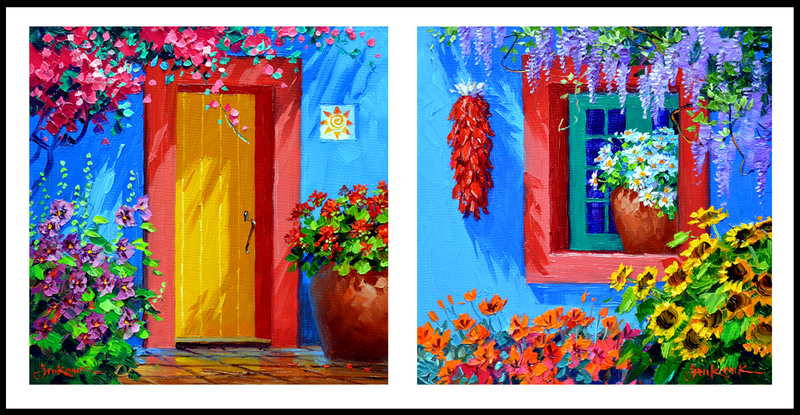 The courtyard of Casa Azul is the theme for my eBay auctions this week. The lovely cobalt blue building was the birthplace and home of Mexican artist, Frida Kahlo. Jack’s portrait of her is shown above. 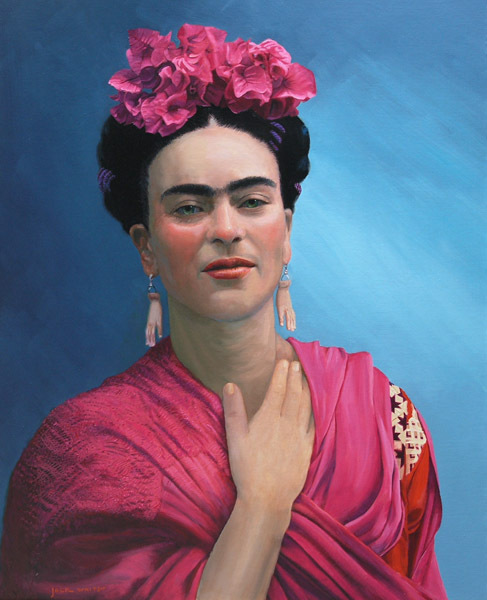 Casa Azul is now a museum dedicated to her art. 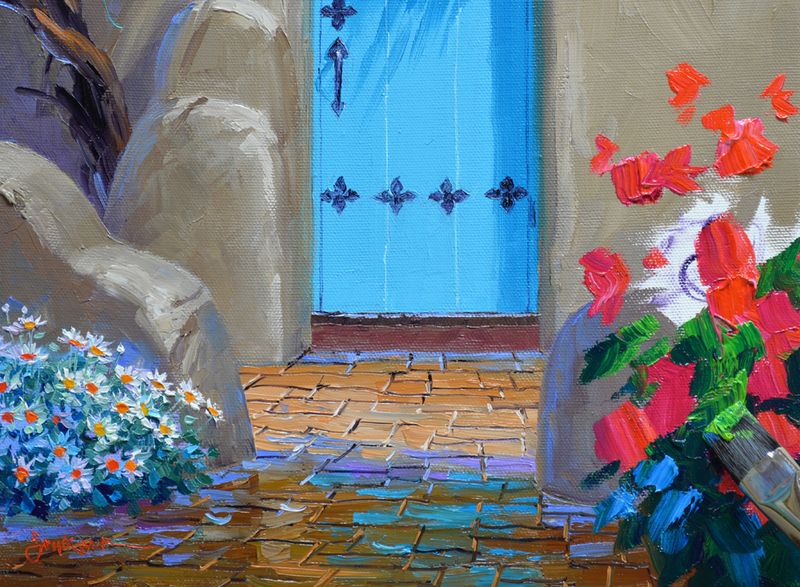 Recently I was commissioned to paint a larger piece of Casa Azul. 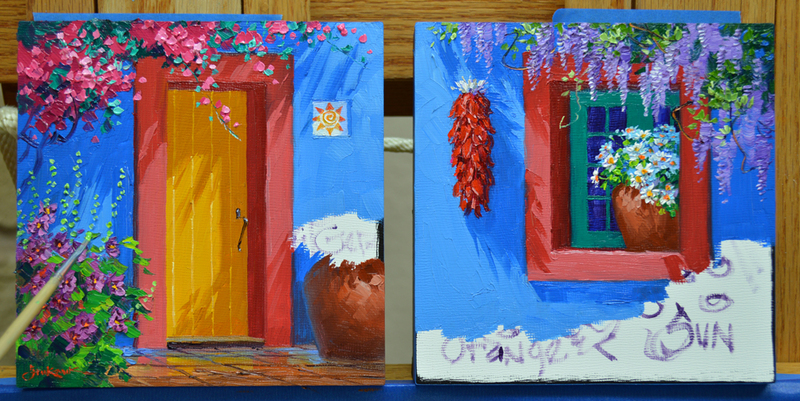 I’ve never painted a garden with blue walls and a yellow door so these EMBRYOS are my color studies. 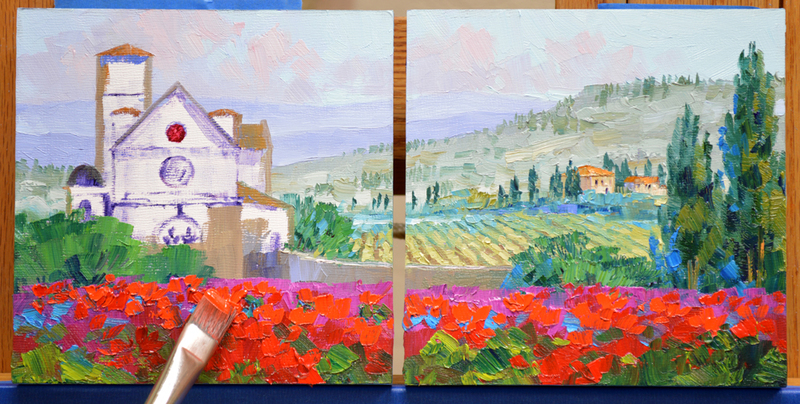 The two pieces are worked on at the same time, as if they were one canvas. My color is mixed and I’m ready to begin painting. The mixtures are #1. Cobalt Blue + a touch of Pthalo Blue + White. #2. Mix #1 with more White added. #3. Alizarin Crimson + a little Cadmium Red Light + White. #4. 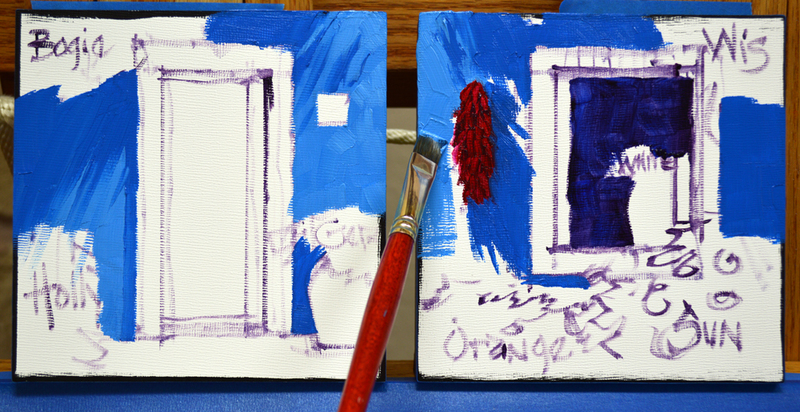 Mix #3 with MUD (Ultramarine Blue + Alizarin Crimson. #5. Mix #3 with more White. If you would like to learn more about our Double Primary Color Mixing System CLICK HERE. 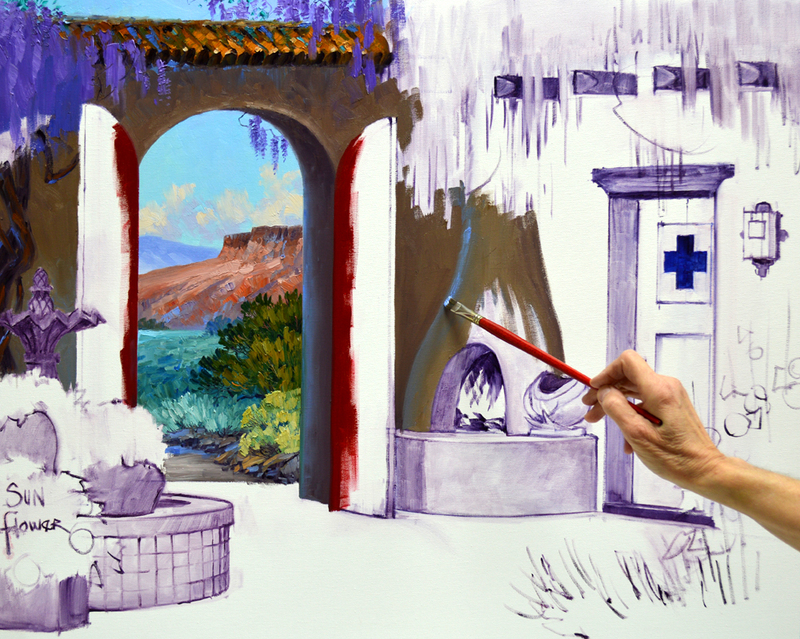 The blue walls are painted first, establishing the light and shadow patterns. Mixtures #3, #4 and #5 are used for the red borders around the door and window. 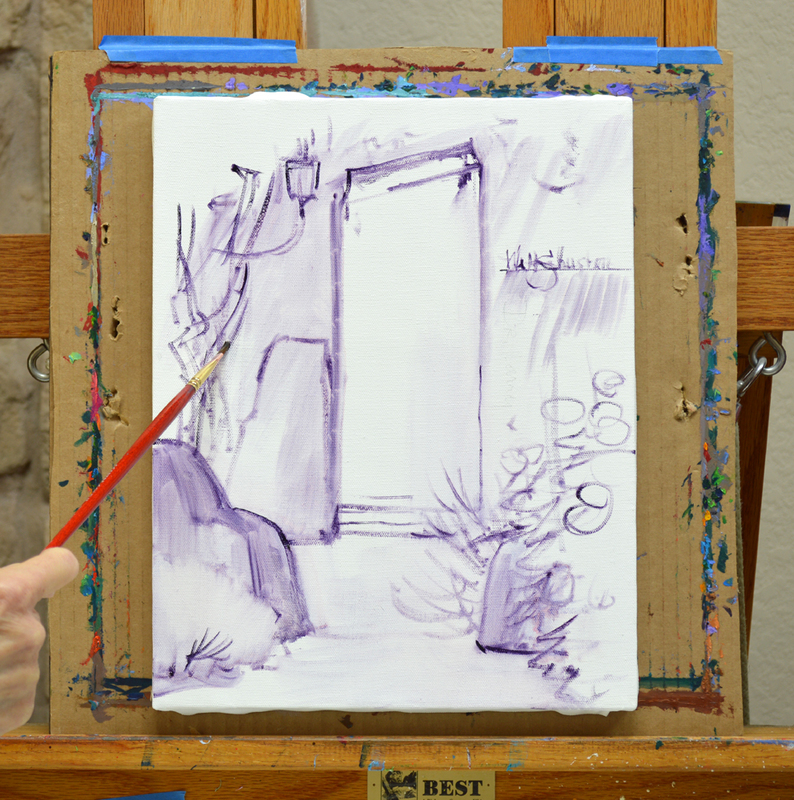 Cadmium Yellow Medium + a little Cadmium Orange + Mud makes the shadow on the door. I use Pure Cadmium Yellow Medium for the sun lit part. 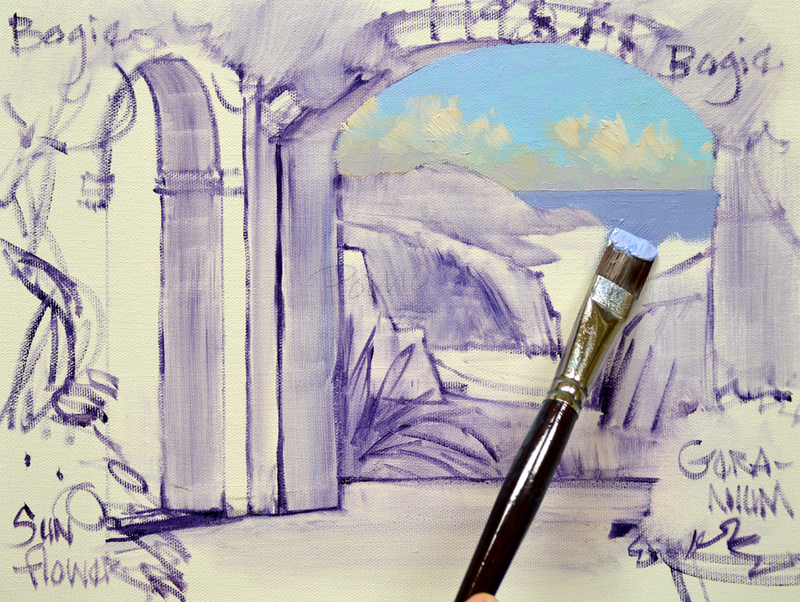 The background of the wall tile is painted first, then the design is drawn with a fine liner brush. 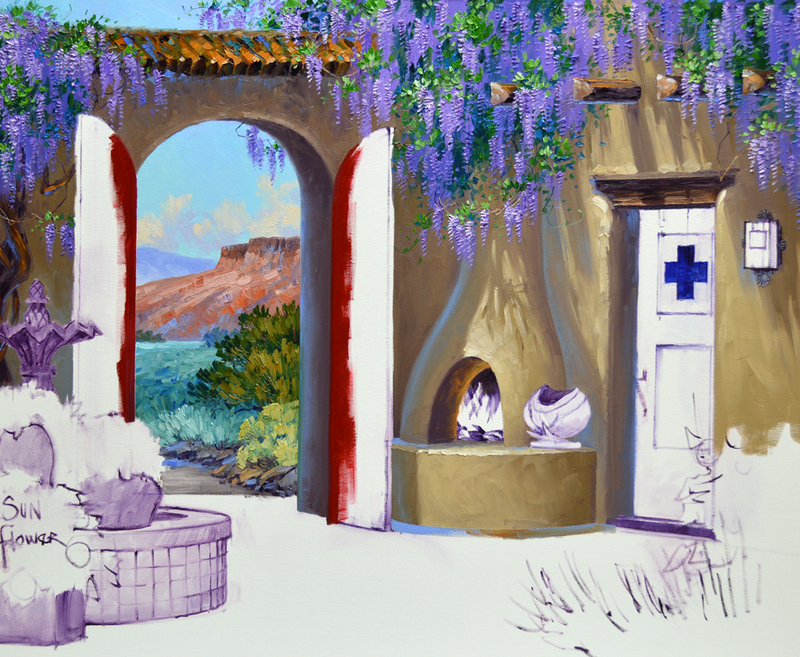 Dioxazine Purple Wisteria works well with the blue courtyard walls. After painting the terra cotta containers the tile pavers of the floor are added. I’m especially pleased with how the color from the door reflects down into them. More gardening. 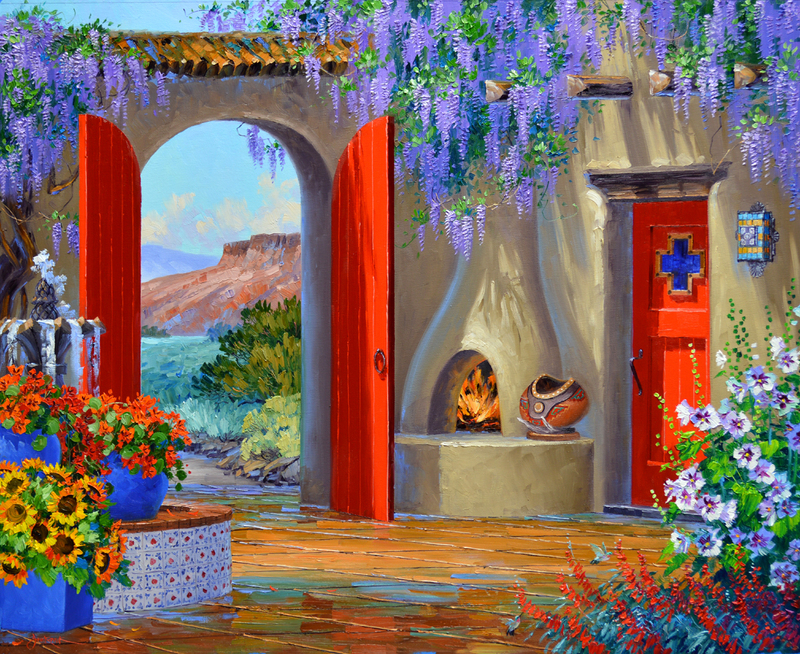 What fun to explore the possibilities of flower combinations in the electric courtyard setting. This has been so much FUN! Take delight in the brilliance of Frida Kahlo’s famous Casa Azul. Let Sunny Greetings and Boisterous Garden color your life every day. Remember, to see this or any of the other images larger just click on the picture. 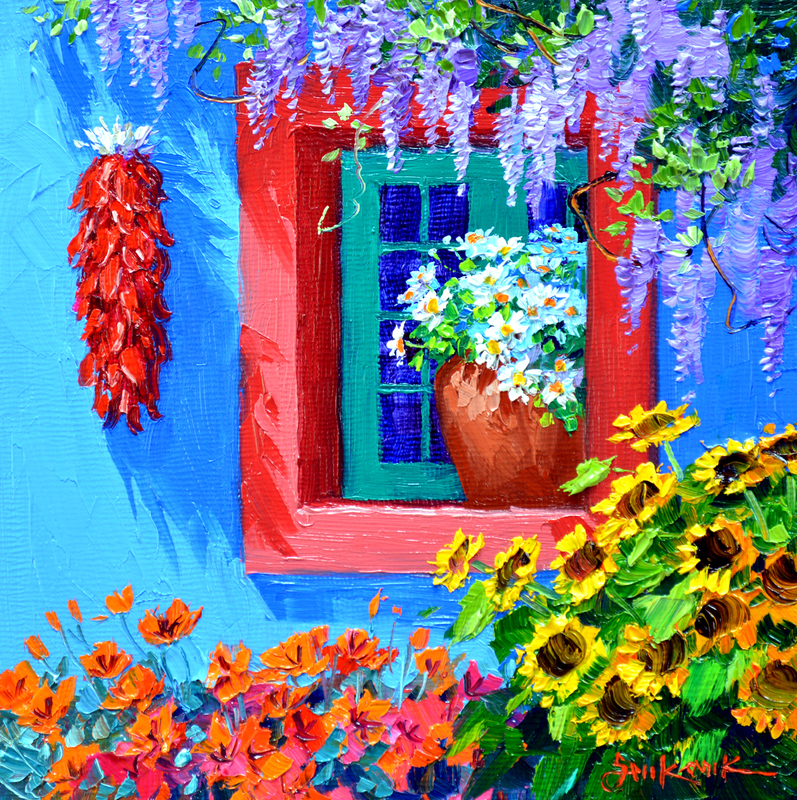 Juxtapose lots of flowers next to the blue walls and a cacophony of color explodes. Bring this Boisterous Garden into your life or that of a special someone. Senkarik EMBRYOS make great gifts that will bring smiles for years to come. 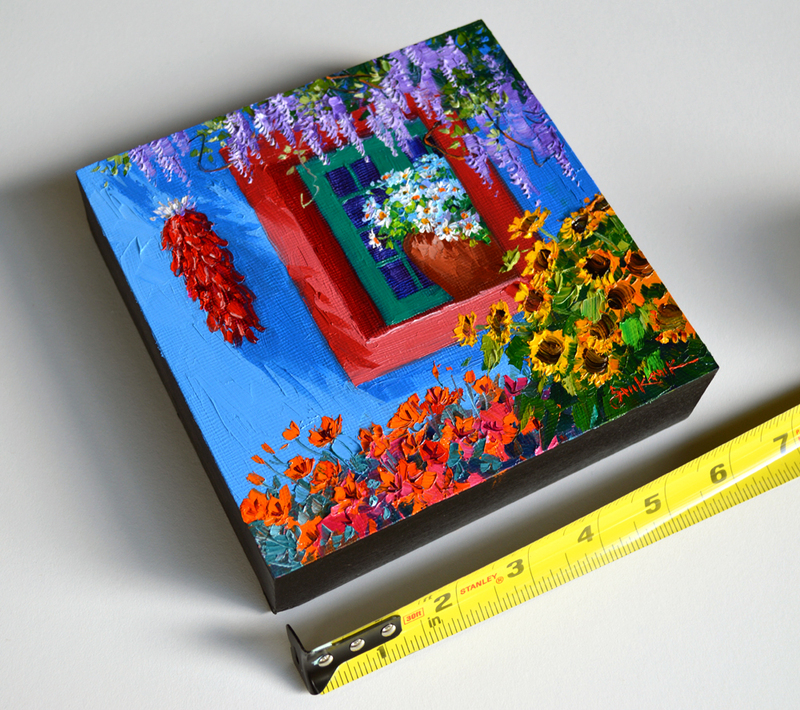 Add a spot of color on your wall and let the little sun face tile welcome you with Sunny Greetings. The EMBRYOS can be displayed together or individually. These original oil paintings retail in our galleries for $390 each but to make it more fun we are starting the bidding on both auctions at 1 cent. That’s right, ONLY A PENNY! 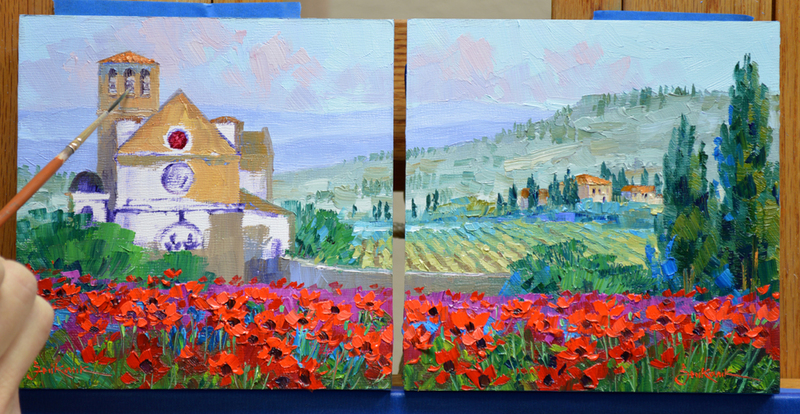 The auctions are staggered 7 minutes apart so you can win one or both Original Oil Paintings for your home or office. AND…..If you win the TWO EMBRYOS we will give you FREE SHIPPING! Don’t linger, the first auction ends Sunday, November 24 at 8 PM Texas (Central) Time. Now for a blast of color. 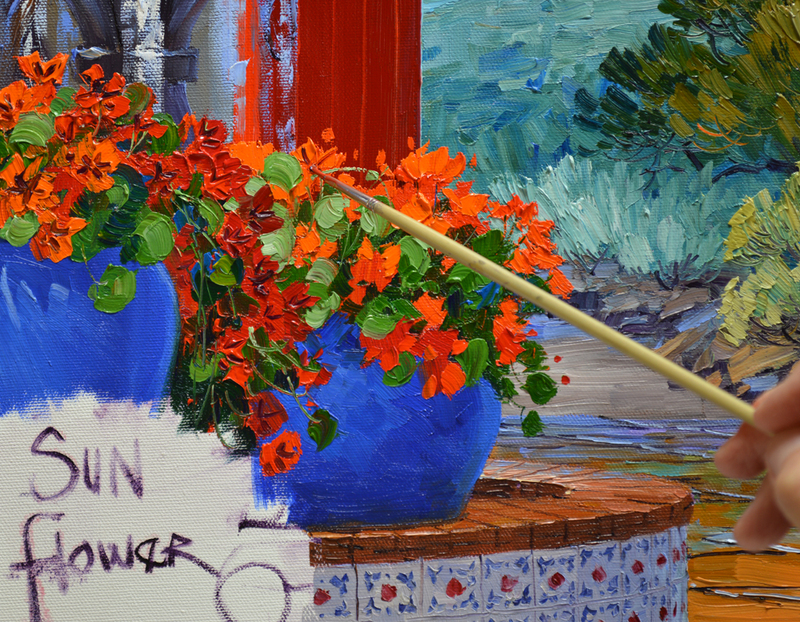 Brilliant Red Orange Nasturtiums fill the two blue containers residing on the rim of the fountain’s base. 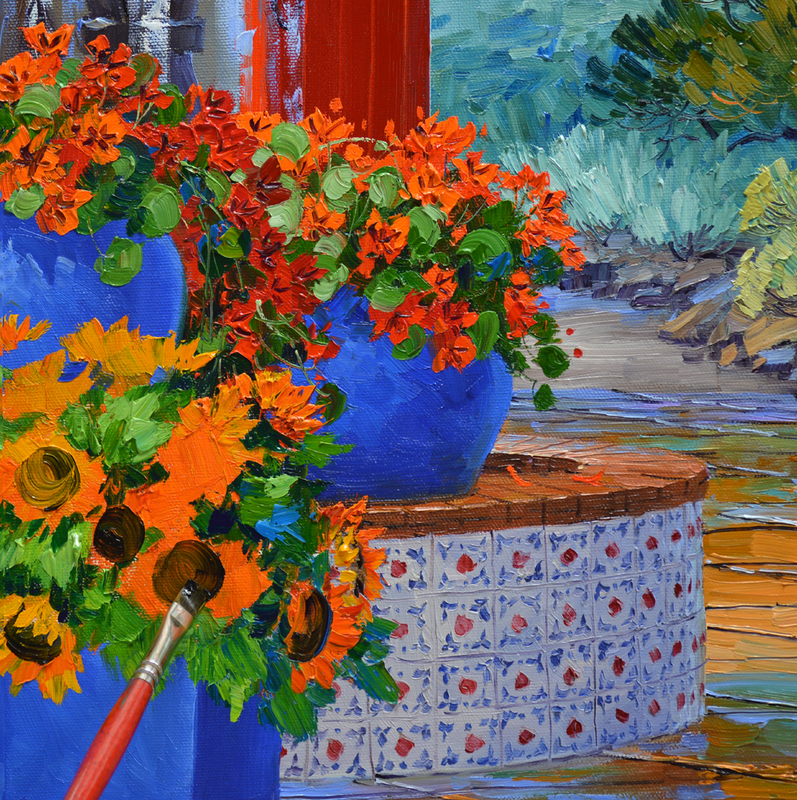 Cadmium Red Deep, Cadmium Red Light and Cadmium Orange make up the cascade of flowers. Warm greens mixed of Ultramarine Blue + Cadmium Yellow Medium are used for the leaves. 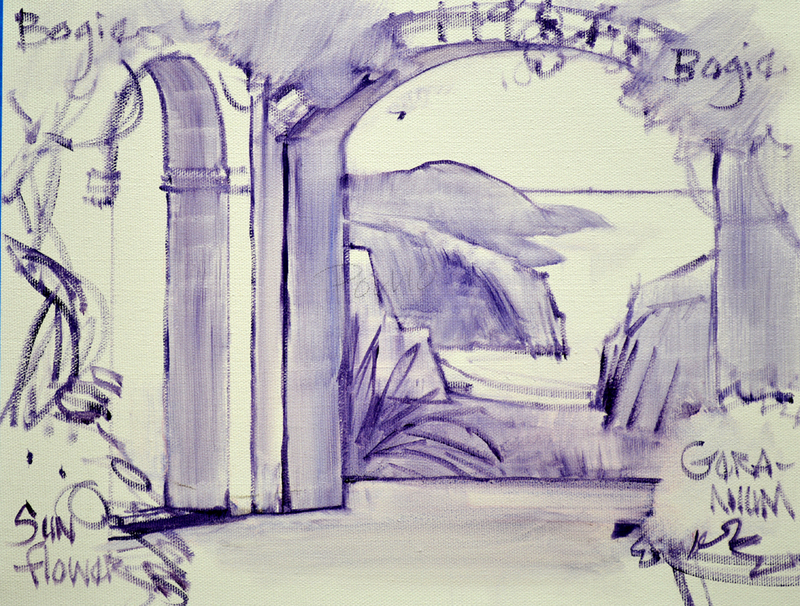 The deep, dark centers are drawn with a brush dipped in a mix of Magenta + Liquin. The blooms of the White Hollyhocks are blocked in with various shades of Lavender and Blue. This base provides the darker shadows that will allow the pure White highlights to POP. Then the broad leaves are painted around the masses of flowers helping to shape them. The centers of the Hollyhocks are made with the same mixture of Magenta + Liquin used on the Nasturtiums. The last step on the Hollies will be to add stalks covered with seedpods and the bright highlights on the papery thin petals. 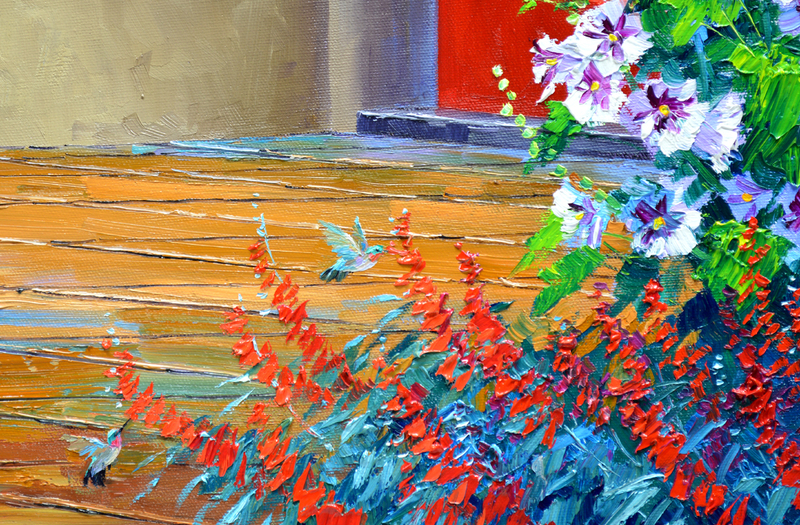 And….. we just had to have a couple of Hummingbirds zipping in and out of the Penstemon in the foreground. If you’d like to see this or any of the other pictures larger just click on the image. Listen closely, can you hear the hum of their wings? One of the things I like most about doing collaborations is adding all of the little details our collectors come up with. These special elements act as memory catchers when they view the painting in their home. 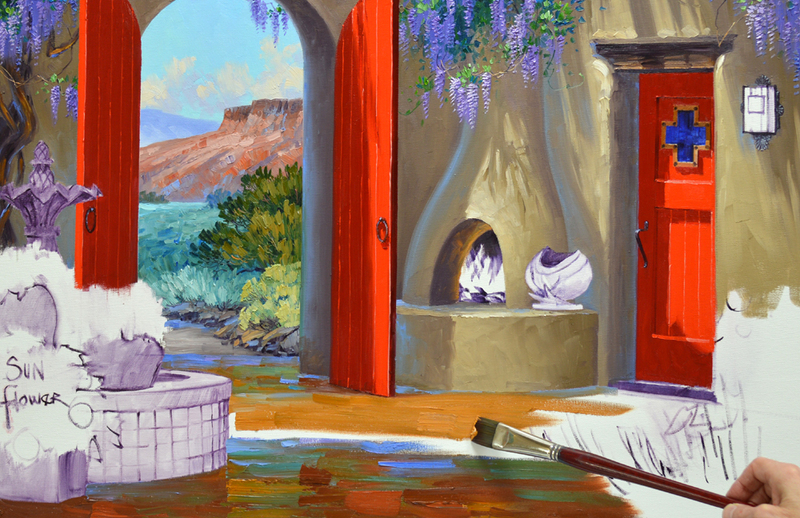 A roaring blaze in the kiva fireplace offers welcome warmth in the coolness of the high desert. Bill and Sarah loved this gourd and thought it would be fun to incorporate its unique design into their painting. Isn’t this a neat lantern? I especially like the way it echos the cross window in the door. To enlarge this or any of the other pictures just click on the image. 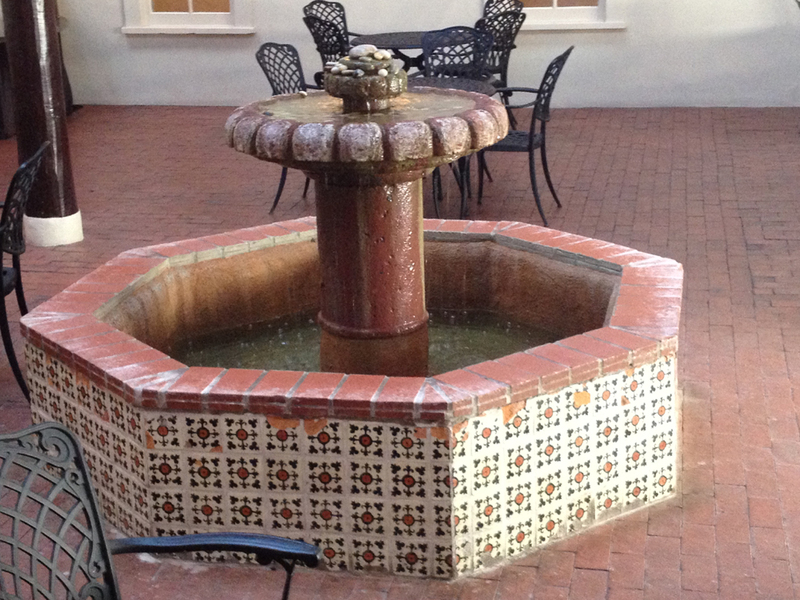 The fountain with the tile base is in the courtyard of the Santa Fe Hilton where we all stayed. The top of the fountain is made similar to the original painting Bill and Sarah saw in the gallery. After it is complete the background color of the tile on the base is painted as a solid mass. Since this fountain is completely in shadow I use Cadmium Orange + Ultramarine Blue + a touch of MUD (Ultramarine Blue + Alizarin Crimson) + White. Then the lines marking the borders of the tiles are drawn into the wet paint. Next I make the dots in the center of each tile, keeping the red muted so it doesn’t look too polka dotty. 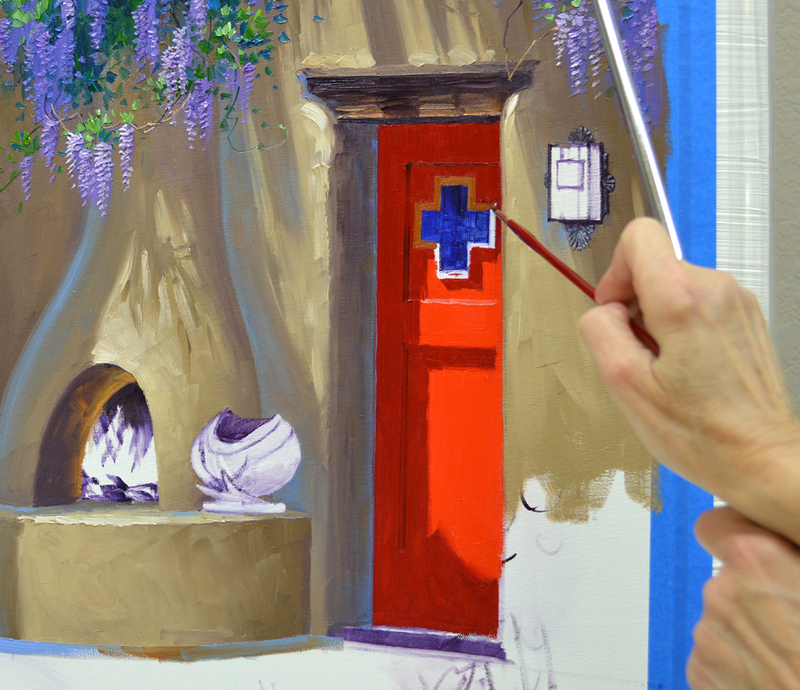 The cool blue greens of the Sage Brush in the background make the red doors POP! I purposely juxtaposed the complimentary colors, red and green, so the doors would look even brighter. 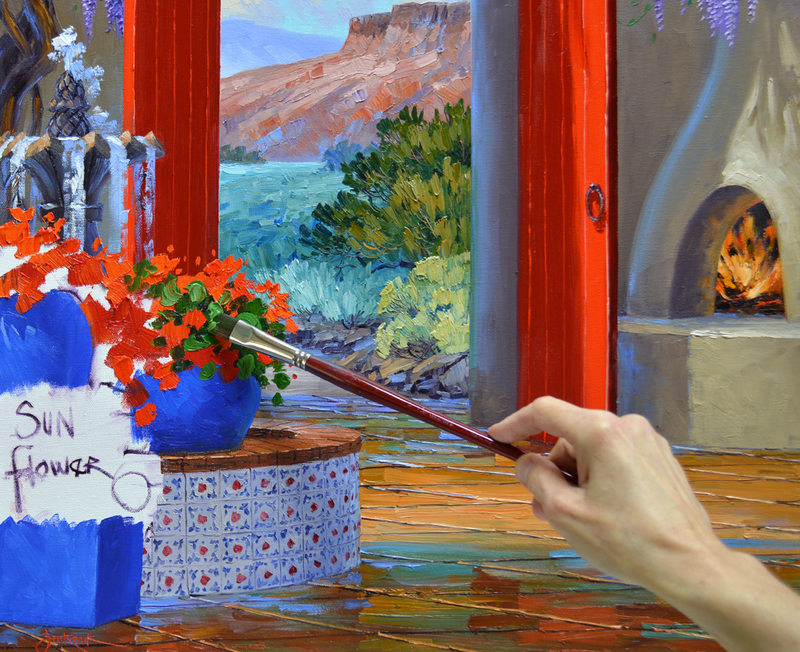 This is one rule I use a lot in my garden paintings: Placing a color next to its compliment, or the hue across from it on the color wheel, makes it appear more intense. 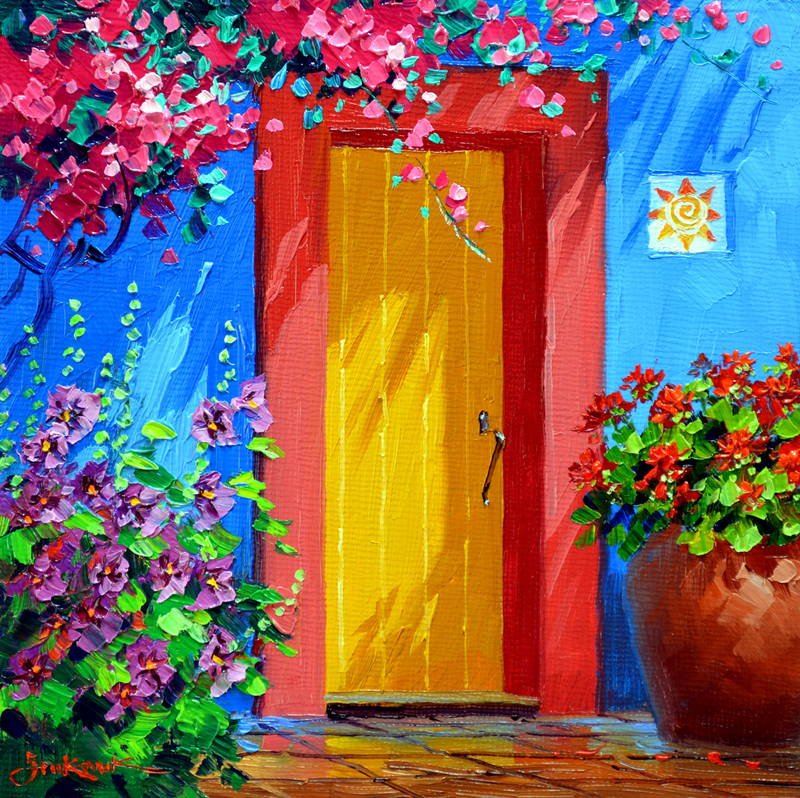 The shadows are made of Magenta + Cadmium Red Deep, while the portion of the door in the sunlight is painted with pure Cadmium Red Light. The entire surface of the floor is covered, establishing the light and shadow pattern on the terra-cotta tile. Perspective lines are drawn into the wet paint of the floor with a fine liner brush dipped in a mixture of MUD (Ultramarine Blue + Alizarin Crimson) + Liquin. Next the horizontal lines separating the individual tiles are drawn. I do this freehand. 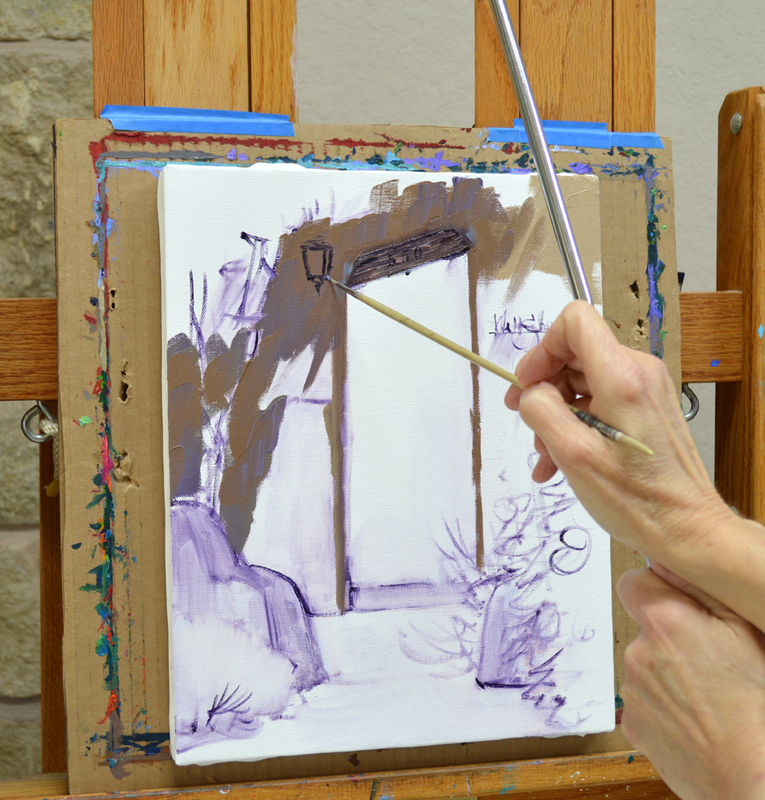 Using a mahl stick would limit the movement of my hand, making it difficult to draw straight lines. Caution: BUILDING ZONE! Constructon begins on the adobe arch with the tile roof. I’ve pulled the far edge of the left door over the distant landscape while it is still very wet. It would be difficult to make a smooth line over the heavy texture of the background if it was dry. I’ll work on the doors later. The distant side of the kiva fireplace is made cooler or bluer. This helps it to recede and gives the impression of “roundness”. The lantern is another of those neat architectural details Bill and Sarah asked to include in their piece. While the paint of the adobe wall is pliable I delineate the sides of the light fixture. 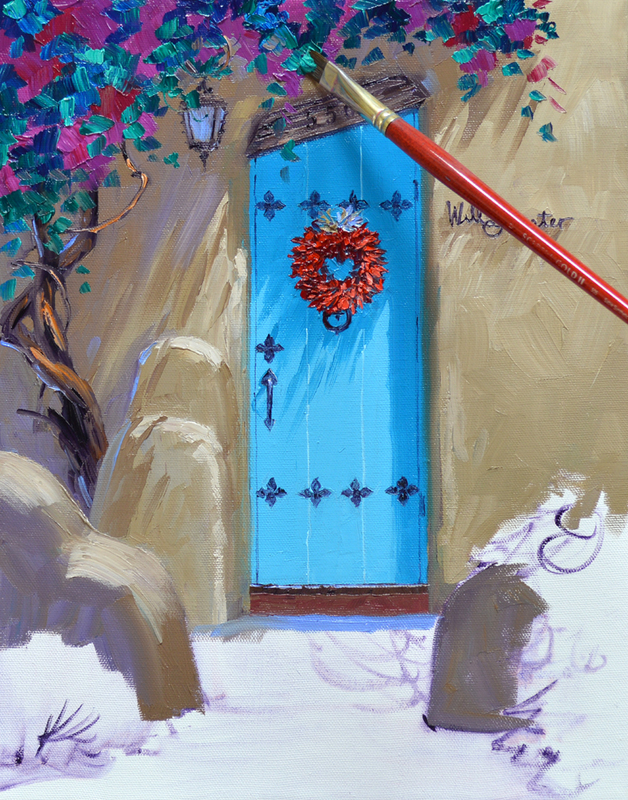 As with the door I’ll come back to finish it in a future session. My wrist is braced on a mahl stick to steady my hand as I do the delicate detail work. CLICK HERE to find out more about my mahl stick. 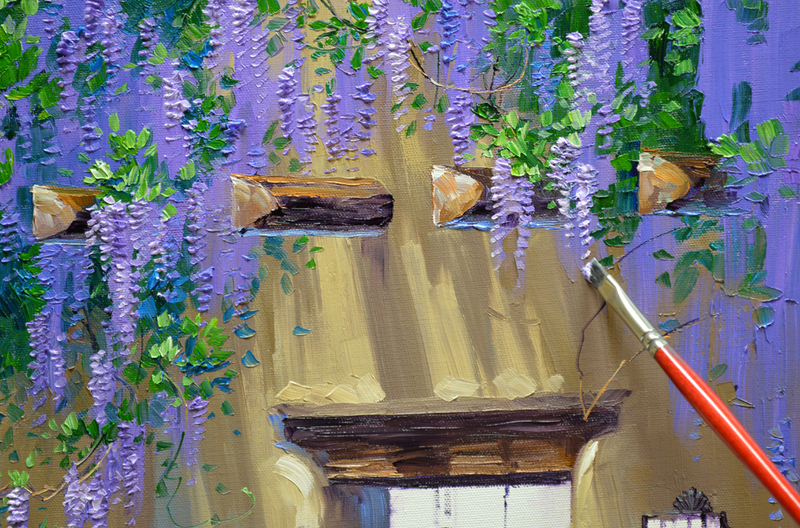 Ah…..Let’s let the Wisteria grow. This is one of my favorite vines! Dioxazine Purple + White are mixed in various proportions to block in the wispy blooms. To enlarge this or any of the other pictures just click on the image. 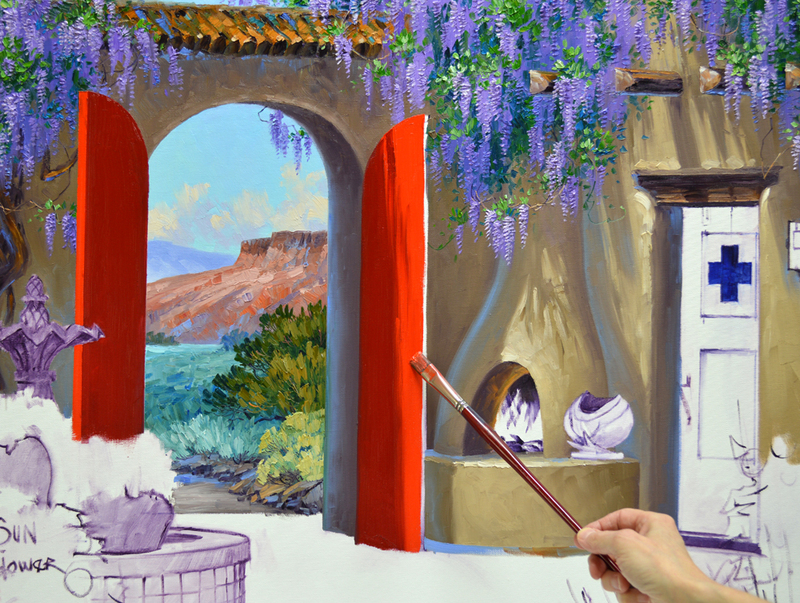 After painting the greens of the foliage around the purple flowers, thin vines are added. Don’t you love the way they wiggle this way and that? It certainly makes them fun to draw with a fine liner brush. 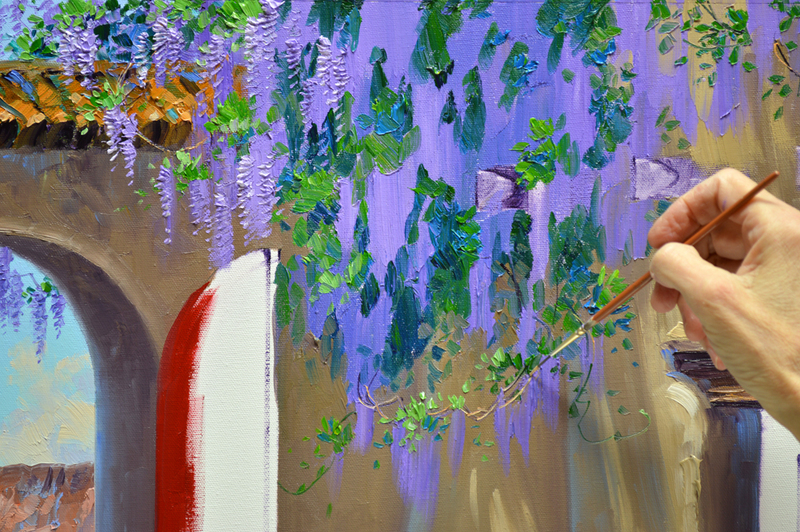 The final touch is to highlight the individual petals of the Wisteria blossoms. 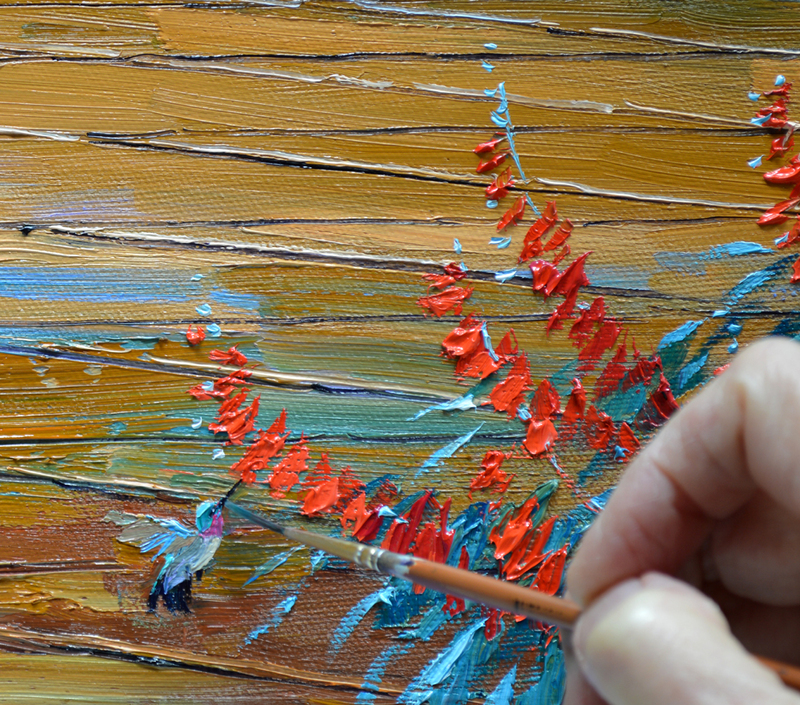 I use the corner of a medium-sized Bright brush, allowing it to dance in a happy cadence across the canvas.